Our Nelson place is the eyesore on the block. We bought it because of that. 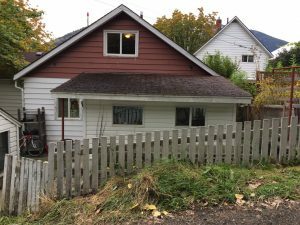 It was affordable and well situated, and that created the possibility of bringing it up to neighbourhood standards and eventually reselling it for a price more in keeping with the rest of the strong housing market. The house has four bedrooms that would make it a great choice for a family with children attending any of the very nearby schools, but it has only one bathroom, off the kitchen. That’s not exactly the way 21st-century homes allocate their square footage. More typical would be two or three bathrooms for a four-bedroom house. So we decided on a two-phase home improvement project. For the first phase we would increase the height of part of the upper story to allow for the installation of a full second bathroom. We would then turn the upper story into a master bedroom suite. This photo shows the south end of the upper floor as it was when we moved in. There is a dangerous steep staircase which pops up into a long dark space with limited headroom. 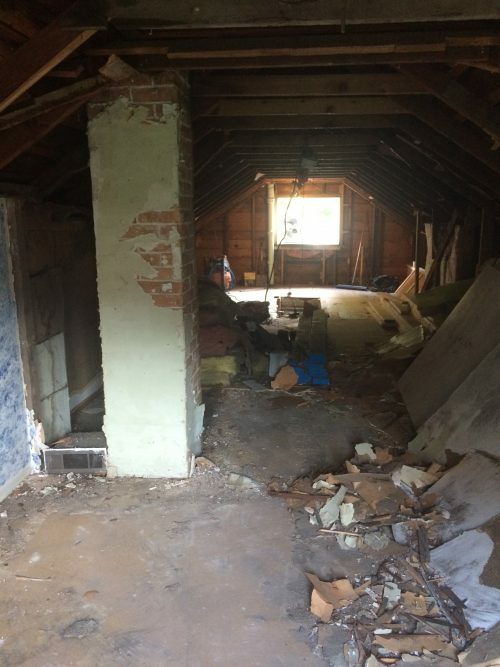 Behind the camera is a bedroom defined by the same sorts of ancient walls and ceiling: uninsulated, smelly and with an “attic” aesthetic. We got a great local architect, very experienced with building codes, local construction and local architecture to draw us up some plans. This end will have the roof elevated on the left side of the photo, and that’s where the bathroom will go. 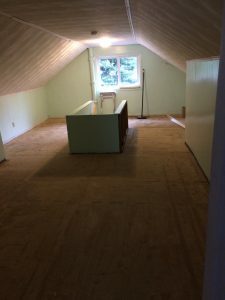 The stairs will be replaced and the remainder of the space will be gutted, insulated and re-drywalled with the addition of skylights and extra windows. It took all summer to get a building permit. The city apparently considers the addition of headroom to equate the addition of floor space. The floor space is actually the same, of course. “Oh, but you’re increasing your finished floor space,” they said. No actually we’re not; it has been finished (panelled, carpeted) for decades. “Oh, but you’re increasing your usable finished floor space,” they countered. Okay, whatever; you can’t fight city hall, right? An engineer had to be involved. A major expense. But she worked quickly and efficiently, and finally it all came together. The contractor showed up at the end of September and got to work. The gutting of the space proceeded really quickly. Footings were poured in the basement. New beams and supports were retrofitted into the basement and main floor to support the new portion of the roof. New joists went into the upper floor to support the tub. Fortunately old vermiculite and cellulose found in the knee wall tested negative for asbestos. Things were very exciting for a while. But then WorkSafeBC showed up with information for our contractor about a new policy on hazardous materials testing for all homes built prior to 1990. This involved much more extensive testing of any materials being disturbed. Work had to stop until a certified person completed a full site review. Another big unanticipated expense. The first results looked great: the flooring and vermiculite upstairs were completely clear of asbestos. But then the last few tests came back showing problems. The greenish stuff stuck to the chimney, some of the vinyl flooring that was a couple of layers deep on the old stairs and all of the drywall joint compound were found to contain asbestos. So that is where we’re stuck now. It means another wait. Now there’s a HazMat removal company that has to review the tests, look at the site, quote a price and do the removal. Presumably they’ll be wearing full-body hazmat suits and swanky respirators and will terrify our neighbours … and maybe we’ll have to vacate for the duration, I don’t know. This new WorkSafe policy didn’t kick in until the summer, well after when we had expected to have the renovation underway, but while we were still held up by the building permit and Land Title glitches. No one knew that we would soon be faced with a huge additional cost. When we did find out we were at the point of no return, with our upper story gutted and partly open to the elements. So I guess we just have to eat the cost, and put up with the delays. Fortunately so far the construction crew has been excellent at containing the mess and keeping the parts of the house we have to live in clean and habitable. A little bit of new siding will be going up as we complete the modifications upstairs, so we figured it would make sense to consider the second stage of our remodelling, which will be exterior upgrades. We had fun imagining all sorts of Nelson-esque colour schemes, surveying the neighbourhood and looking for houses we really liked the look of. 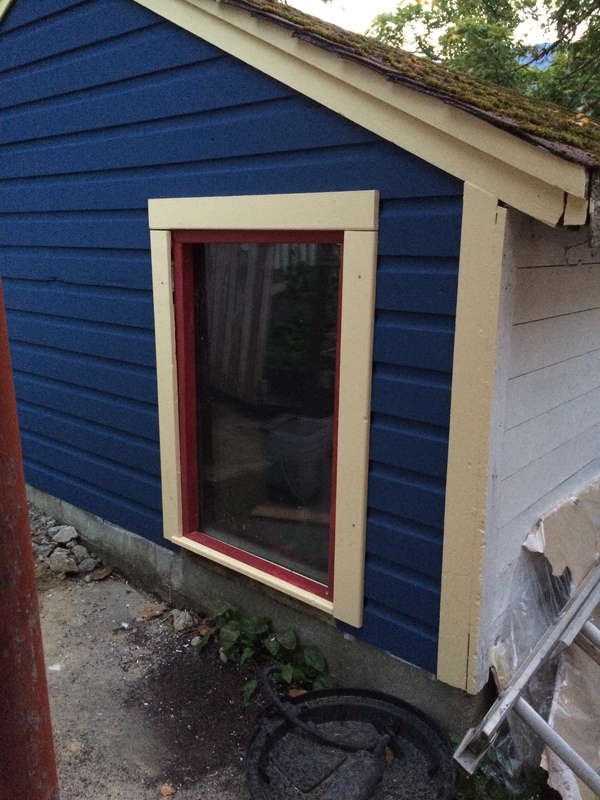 We settled on blue, with cream trim and purple-red accents. I painted one side of the garage in the last snatches of fall sunshine and warmth to make sure we were going to be happy with it. I think we are. It sure beats the peeling 1970s white and barn-red. This part, at least, has been straightforward and enjoyable.